Using a DT-5TS with a rotary encoder attached to a 12-inch circumeference wheel it can monitor the linear speed of a rotating container. With the RE1B-60F rotary encoder the DT-5TS can measure values as low as 0.2- 30,000 RPM. Using the 12 inch circumference wheel a relationship between RPM and inch per minute can be established. 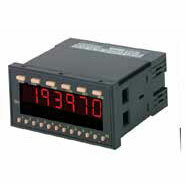 If a relay or proportional analog output signal is desired to connect to a controller or data logger, the Series DT-5XR with appropriate output module will satisfy the requirement.